The hamstrings are three long muscles which cover the back of your thigh, extending from your seat-bone (ischial tuberosity) down to the back of your knee. They have long tendons, as the name suggests. 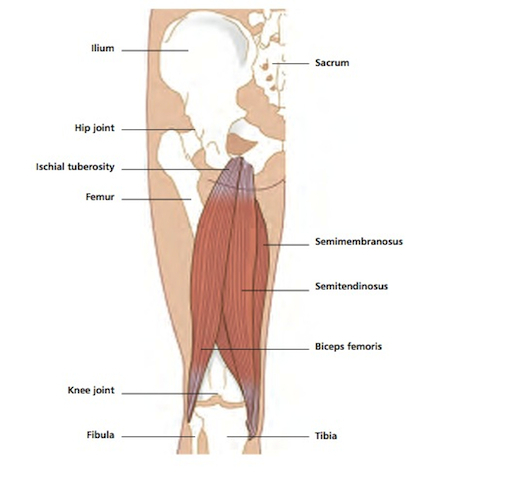 Semitendinosus has the longest tendon, which is attached at its lower end to the inner side of the top of the shin-bone (tibia) at the back of the knee. Underlying semitendinosus is semimembranosus, a fleshier muscle, which is also attached to the inner side of the shin-bone. These are the medial hamstrings. The third. 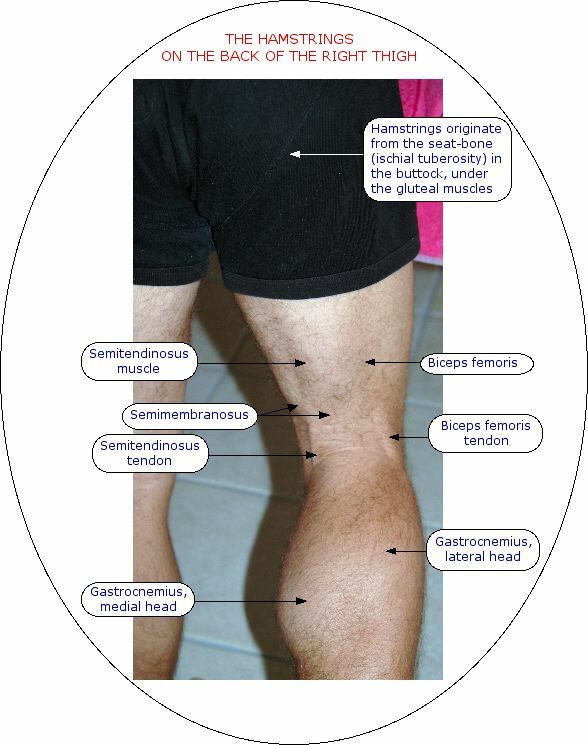 lateral hamstring, is called biceps femoris, because it has two heads at its upper end. One head forms a common tendon with semitendinosus on the bump of the seat-bone, while the other is attached to the back of the thigh-bone (femur). 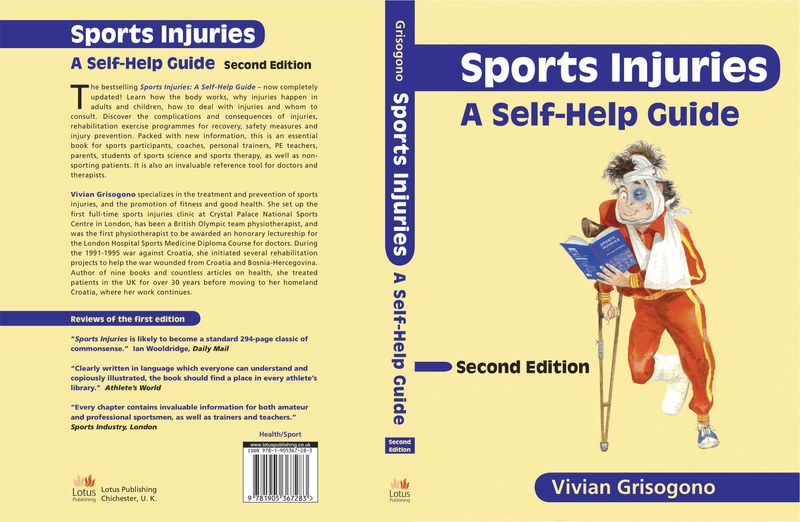 Biceps femoris spreads downwards and outwards to be attached to the top of the outer-leg-bone (fibula) and the outer part of the top of the shin-bone at the back of the knee. The sciatic nerve supplies the three hamstrings. Sitting with your knee bent, you can feel the tendons of the hamstrings at the back of your knee with your hands. The cords stand out if you draw your foot back slightly towards your chair. Working concentrically, the hamstrings bend the knee against gravity, and control the opposite movement, working eccentrically or paying out, when the knee is straightened in the direction of gravity. For instance, if you lie on your stomach and bend the knee, the hamstrings perform the movement up to the point where your lower leg is at a right angle to your thigh, and then they control the movement if you straighten the knee back from there. If you bend the knee beyond the right angle, the movement which brings your foot towards your bottom is mainly controlled by the front-thigh muscles, against the influence of gravity. If you stand up and keep your thigh absolutely vertical (not an easy thing to do), the hamstrings perform the whole movement of bending your knee and bringing your foot up behind you against gravity, and then they control the reverse movement under the influence of gravity. As they are attached above the hip joint, the hamstrings also extend the hip against gravity when you are standing up or lying on your stomach, and they control the reverse movement in the direction of gravity. This means the hamstrings help the gluteal muscles to take the leg backwards from the hip, and they also help to straighten up your trunk when you bend forwards from the hips while standing up. When your knee is bent, the medial hamstrings help rotate the knee to turn the foot inwards, while the lateral hamstring turns the foot outwards. The hamstrings are active in all movements of locomotion, especially running and sprinting. In the normal way, the hamstrings are relatively weak compared to the front-thigh muscles. Racing cyclists may have equal hamstring and front-thigh strength. The hamstrings can also help identify if you are relatively dehydrated. Lie on your stomach and bendi one knee fairly quickly about five times, then the other: if this causes cramp in the back of either thigh, you probably haven’t drunk enough water recently, or, less commonly, your mineral balance isn’t adequate. Because the hamstrings have such long tendons, they are relatively inelastic. You have to be careful how you stretch them, in order to avoid damage through over-stretching. The hamstrings tend to tighten through any number of causes. Sitting for long periods with the knees bent shortens them. If you don’t drink enough fluids, the hamstrings, like the calves, become less efficient. If your back is stiff or weak, your hamstrings may compensate, becoming tight through over-working. The hamstrings compensate if there is weakness in the calf muscles and vice versa. If there is a big imbalance between the front-thigh muscles and the hamstrings, the hamstrings are more likely to strain or tear under pressure, especially during sprinting. This can be caused by unbalanced strength training programmes, especially failure to work the hamstrings through their full range when doing strengthening exercises. Knee problems very often cause problems with hamstring function. Some knee problems affecting the centre or back of the joint cause inhibition in one or more of the hamstrings, making them inefficient. All too often, rehabilitation programmes focus on the front-thigh muscles and neglect the hamstrings, causing potentially dangerous imbalance. Because the hamstrings have a strong influence on the position and actions of the hip, pelvis and lower back, they are often affected in injuries to these areas. Any problem with the sciatic nerve inevitably weakens hamstring function, causing imbalance between the trunk and the leg, between the front and the back of the affected leg, and between the hamstrings and calf muscles. All of which can lead to secondary problems later on.